Lucy by Revlon is a gorgeous, long, straight style with a monofilament crown for a very natural appearance. It has a beautiful full bang and lots of attitude. 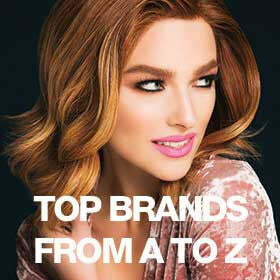 Best of all, with its synthetic hair, it's ready-to-wear! Monofilament crown creates the illusion of a natural looking scalp where the hair is parted at the crown. Approximate Length: Front 3" | Crown 17" | Sides 13" | Nape 11.25"